Lunch Box (Toughness: 8) - Fast and flying. Releases rice balls which have fast and tricky movement. This is a very dangerous and tough enemy. In the starting room, in the ? box on the upper left. This is the hardest Secret Bonus in the game to get. Besides a couple of smileys, the only thing with which you can adjust score is a lunch box. It is best to save a P power for the start of scene 7, in which case you can use a kid. Otherwise, you'll have to use Genzoh unless you start with the right score. A good place at which to hit lunch boxes to adjust score is just in front of either ON gate. Within plain reach, except that the unwary may fall through a fake floor. If you fall through (or if you leave the first room through the right ON gate), your only way to climb back up is to ride the broom. 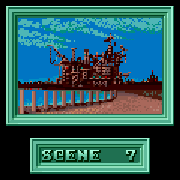 Scene 7 is hard, with very threatening enemies and lots of dangerous terrain traps. The key to clearing certain sections safely lies in 'magic spots', which banish (and create) moving boxes in additional to enemies. 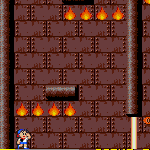 You start in a large room with a lunch box, the Secret Bonus, two ON gates at the top, two light switches at the bottom, and several columns of fires. Although about the top third of each column of fires are false, the lunch box makes the room a very dangerous place, until you have climbed to the top. The light switch on the right also generates 2 moving boxes for your foothold, but the one on the right may squash you against the ceiling if you're careless. Beginners who are not playing for high score should just get out of this room as quickly as possible (you may even use Makoto for this purpose; leave through the right ON gate for the easiest route: the fires blocking the gate are false), while experts may want to get the Secret Bonus, and even to touch the right ON gate (for the extra time) before leaving through the left one. In the large room on the left, you can banish the lunch box using the magic spot in the lower left corner. It is replaced by an umbrella, but that is hardly any threat. 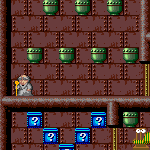 In this large room (and the one on the right), you should remember to leave some of the lower food pots as foothold until you've collected the ones higher up. In the corridor below the Magical Bonus, it is recommended that you banish the chair by entering the right room before trying to force the heavy door or collect the food. In the large room on the right, if the lunch box (with the rice balls) gets too annoying, you can banish it momentarily by retreating back to the corridor. The way onward is through a fake floor in the small room with the 5 ? boxes. Naoki is the only Esper who can pass through the corridor with the vertically moving boxes without the broom or a Stop icon. (Do use Naoki; he is good for the oncoming sections too.) This corridor is in fact quite easy, once you know how: since you won't die for touching the sides of a moving box (here, you die only when you're squashed vertically), you can start pushing right on the joystick when the moving box is at the lowest position, and Naoki will automatically walk under the box safely when it moves up. There are concealed fires on the floor, so don't forget to turn off the lights. After that is another corridor with a few moving boxes. That shouldn't be too difficult. Beyond that is yet another corridor with a chair, some food pots, and some fires. Don't worry too much about fighting the chair, and pass through this section swiftly; leave a few food pots to block the chair if you need to, especially before you have opened the first 2 smiley ? boxes at the end. After passing through the ON gate, there is a dangerous vertical room with many horizontally moving boxes threatening to crush you to death against the food pots, the walls, and the fires (all real ones). 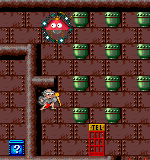 It is possible to clear this room with skill and swiftness: do open the food pots to clear a path for yourself. But it is much safer and easier to clear this room using a Stop icon or the broom. You can hit Zara on this side of the ON gate if you banish the moving box above (which blocks your access to the blue jewel) using the magic spot in the upper left corner. In the vertical room below, the first row of fires directly below are false ones. Don't run into the real ones trying to avoid them. 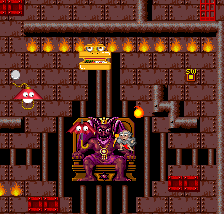 In the vertical room beyond the ON gate, you can banish the 2 moving boxes by entering the magic spot in the lower left corner, and you can banish the umbrella too by waiting there for a few seconds. Finally, you come to a large room with lots of food pots, and a small room to its left with a group of ? boxes. If you don't have the P power, use Genzoh here. You can replace the lunch box and the umbrella with a lamp by hovering in the magic spot to the upper left of the telephone booth, though it can be argued that the lunch box is less of a threat when trapped by the food pots. 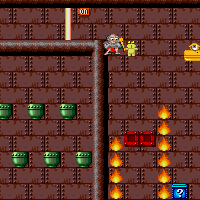 Against the Satan in scene 7, you are faced with a dilemma: to use Genzoh or not to use Genzoh. Genzoh has his powerful staff and excellent hovering, but his slow speed makes entry into Satan's room around the moving box dangerous. A kid has little problem getting into Satan's room, but the ensuing prolonged fight is likely to reap casualties. My recommendation is to use Genzoh, in accordance with the Chinese proverb "prefer short pain to long pain". Move quickly, lest enemies will block your way and make it more dangerous. Use the same timing trick as the one you used in the corridor with vertically moving boxes, and turn around quickly. If you have a Stop icon, use it here. Make sure that you don't waste it by picking it up at the wrong timing! Wait until the moving box is down low. If you're not confident with the timing, forget about the Time UP and deploy the Stop icon using its ? box (since you can see more of the moving box from there). The All Gold Bonus in scene 7 is probably the most difficult one to get in the game. Having to get the difficult Secret Bonus at the very start makes it difficult to start with the set you want. 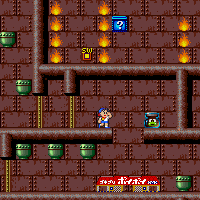 There are big rooms with many food pots and very dangerous enemies, and the dangerous vertical room with many moving boxes is also a major cause of error. You basically have to maintain the modulus count throughout the scene (until you are down to the last set). You need to know the food information well, so that you can try to get the small sets sooner. The smiley ? boxes are in 3 large groups, and you can widen the margin of error by opening them at break points. There are 16 food pots in each of the initial two large rooms, and 6 food pots in the corridor joining them. After the corridors with many moving boxes, there are another 6 food pots in the corridor with the chair and fires. 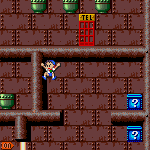 There are 9 food pots in the dangerous vertical room with horizontal moving boxes. Finally, there are 17 food pots in the final large room. This page was last edited on 13 December 2010, at 21:05.